When United's most successful captain came to the end of his Tannadice career, he moved on to St Johstone for a brief spell before being appointed player/manager at Forfar Athletic in 1990. When Forfar were relegated in 1992, Hegarty left Station Park and returned to Tannadice as a coach, and was part of the backroom team when United won the Scottish Cup in 1994. 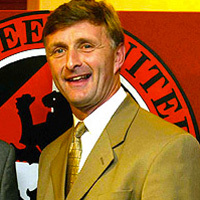 Hegarty went on to take coaching roles at both Hearts and Aberdeen during the late 1990s, and was appointed caretaker manager at Pittodrie in 1999 after the dismissal of Alex Miller. He returned to Tannadice once more as a coach under Alex Smith, and was made interim manager when Smith was sacked in 2002. Although originally extended until the end of the season, Hegarty was sacked in January after a bad run of results. Hegarty continued in various coaching positions at a number of clubs - including a short spell as Livingston manager in 2008 - before returning to United in 2010, just in time to be a part of the Scottish Cup winning team. He was once again appointed caretaker manager at United after the departure of Peter Houston in 2013, before Jackie McNamara was offered the full-time job.